And the controller looks same. It is probably a 1204-something. 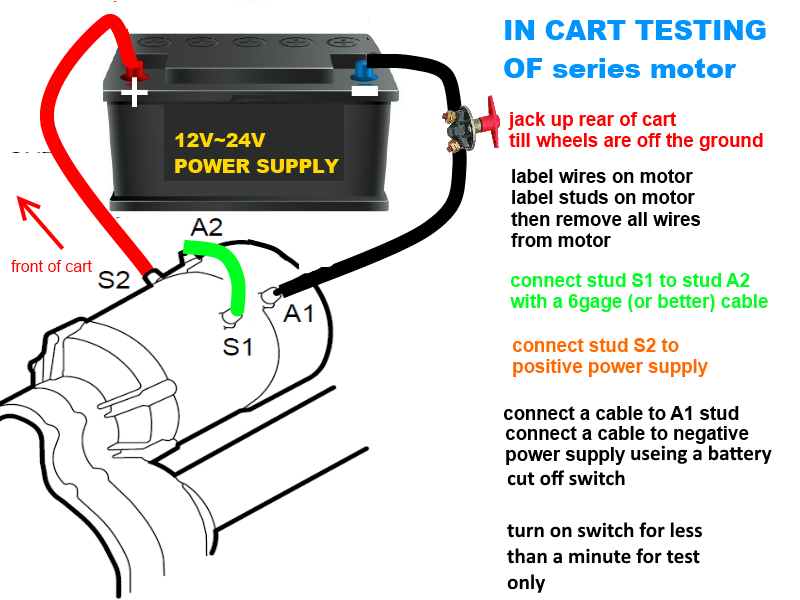 But, I don't know if that is the correct one for that motor (assuming you have a CC motor and rear). Check and make sure you have a CC motor and rear. I would then go by the diagram I told you about and change out the parts and places to do this thing the way it should be. Do you know anything about the history of this cart? Not to much.... I was told that a old lady had it and it didn't run so a guy bought it changed the batteries to what the are now and ran good. It was parked in the fall last year and now it doesn't run. I don't want to discourage you but you have a mess. You have a cart somebody put parts in to make it run (if it ever did) instead of getting the correct stuff. Somebody has robbed parts from that, and there is no way of knowing what is gone, or how they connected or attempted to connect it. WARNING you don't want to make a big spark anywhere near the battery. As CTD said you have a good platform for a nice cart. Soak down the motor studs with PB blaster or something similar, and be cautious using 2 wrenches to remove the motor cables. And they need replacing too.